As if being the son of Wayne Gretzky wasn’t enough of a media burden, Trevor Gretzky also had to deal with some “unnecessary attention” while attending high school in Los Angeles alongside the sons of Joe Montana and actor Will Smith. MiLB.com: You’ve worn No. 9, 19 and 29 so far. I’m guessing the nine is a nod to dad, but let’s say you reach the Majors, what number are you going with on the back of your Cubs jersey? Gretzky: It’s always been a dream to wear No. 99. Hopefully, I’ll get a chance to wear it one day. That’s irrelevant right now – I’ve got to focus on getting my career where I want it to be. Perhaps if the nearest hockey rink to his home growing up hadn’t been an hour away, this Gretzky might have wound up more attuned to a pro hockey career. 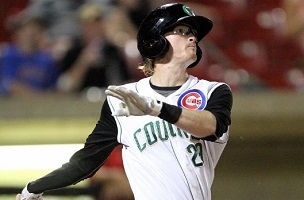 But as he tells Wild, his parents were completely open to whatever he chose and now, in his third spring training, the goal is the Cubs not the Canadiens. Read the rest of the Q&A here. In an odd bit of timing, several hours after this item was posted, L.A. Times baseball writer Bill Shaikin reported that Gretzky has been traded by the Cubs to the Los Angeles Angels of Anaheim for Matt Scioscia, son of Angels manager Mike.